saved points to get better deals or even get FREE stuff. - Points are automatically posted to your account when your order ships and can then be used immediately as a credit toward a future order. Points remain active for a period of one year. - Sorry, but qualifying purchases do not include orders where previous points were redeemed, taxes collected, or shipping costs. * Points will not add automatically if you checkout anonymously. * MyRewards credits will not be earned on orders where existing credits have been redeemed. 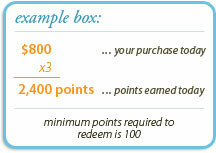 - You'll receive $1.00 in credit for every 100 points that you redeem. For example, 2,200 points = $22.00 in credit. Please see the Terms and Conditions for program details.